This is the fifth part of Beauty and the Beast (BatB): The Linda and Patrick Story. On the main blog, there is a list of all the chapters if you need to get caught up. It was the summer of 1990 and we saw each other every day. We found jobs at the second biggest airport shuttle service in LA, (not the blue ones the crimson red ones) as reservation agents (RA). I convinced Linda into joining me there with lines like, "It's super close only 10 minutes from here." [It was more like 30.] So if we weren't working together or at Church, we went out on dates. It was fantastic! Whenever you call a customer service center, like the one above, you can bet that the people are messing around when calls are slow. We were no exception. We would challenge each other to take entire reservations using Australian or English accents. One time, I turned my chair on it's side and pretended I was on the Millenium Falcon shooting down tie fighters. The best thing we did, other than leave cute love notes in each other's inbox, was play pranks on those we worked with. We could see our friend Ruth in the reception area, through closed caption TV (now that I think about it I don't see the logic in that). So I called the main number. Ruth: Red Van Shuttle, the crimson van not the blue, serving all of Orange, Ventura, and Los Angeles Counties, some of San Diego, and for an extra charge Santa Barbara, this is Ruth, how may I help you? Me (in my best old man voice): Hello! Ruth (rolling her eyes, cursing the day she took this receptionist position, but with a very pleasant voice over the phone): Yes how may I help you sir? Ruth: Sir do you know the driver's name or van number? Me: It was a red van, red one! I need my Depends, I can't go to Puerto Vallarta without them! Uh-oh I think I just peed my pants [remember I'm doing this in old man voice]. Wait a minute, I think I left my teeth on the van too! You get the picture. I must have kept the old man bit going for at least 10 minutes. Every 30 seconds Ruth's blood pressure would rise to dangerous proportions. The RA area was riotous! When calls would come in, the people on the phone had to mute every time they weren't talking. It was epic! At the end, I changed back to my regular voice and said, "Ruth, it's me...Pat" Oh my Gosh, if it is possible she was livid and cracking up at the same time. If she wasn't afraid to get fired she would have rushed the RA area and killed me! Here's the best part; through our 3 years of dating they kept asking us to come back to work for them...because we were so responsible! If only they knew. In fact, when the company hired some consultants to help take the business to the next level, they asked me, Patrick Zalamea, to be the RA representative...classic. That's how we spent the summer, either at the shuttle company, on a date, or at church. It was great. A couple of times that summer we went on camping trips to the Oceano Dunes...yes the ones we live 10 minutes away from now. 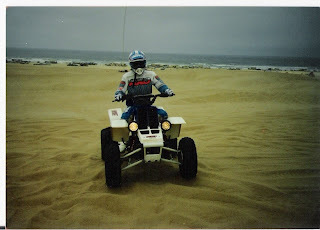 My family had a couple of Quads that we towed up to the Dunes in our RV. We'd get stuck, sometimes for a week at a time and just ride. It was insane! On the first trip, we saw the sign above: No Passengers. We only had three quads on that trip for four riders. So we did what any red blooded, Bible believing Christian would do: we broke the law. Repentently, I think back on those days and wonder what the heck we were thinking! We parked right next to some Dunes and would sneak in away from the Park Ranger's trucks and jeeps and have a blast. One night, we were doing a speed run. This is where we went as fast (and I mean so fast it scared you) as our Quads would take us along the beach...in the dark. I would wear no helmet, Linda would ride on the back with mine on, and my brother and his friend would try to keep up with us. After a run, we were sitting on the Quads talking and up pulls none other than a Park Ranger. Pause. Remember, I had accepted Jesus less than a year before this time. So I sometimes still had sinful first reactions. This was one of those times. I started up the Banshee and took off...in the pitch dark...into dunes...with a Park Ranger hot on my tail with lights flashing. It was like a scene out of the Dukes of Hazzard. I remember Linda yelling into my ear, "What are you doing? Stop! What are you doing?" 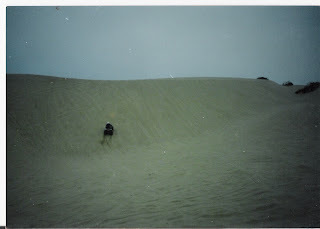 I remember thinking once we get past the first set of dunes there is no way he is going to follow us in that SUV. Guess what? He did. Not just past the first set, but the second and third as well. Then he stopped. 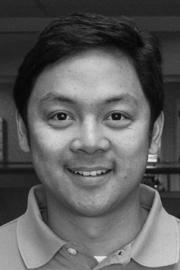 I remember looking back and seeing him at the top of a dune and turning back. I also remember us hurtling over a dune in the pitch black. It must have been a big one, because it took a while for us to hit the ground. When we did we almost hit some kind of dune vegitation and I had to swerve to miss it. I turned everything off, engine and lights, and waited a little bit. Linda wouldn't talk to me...I think she was in shock. Once I felt the coast was clear, I started the Banshee up and headed back to the RV. Now I had already made mistake #1 by running from the law. So I made mistake #2 by leaving Linda alone by a mile marker in the pitch black to check our camp for cops. The coast was clear and I went to go pick her up. She wasn't very happy with me and I apologized profusely. It was a knee jerk reaction from my old days. 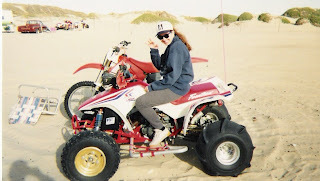 See back then: 2 broken laws (no helmet and passenger on quad) + Park Ranger shows up = RUN! Me: Yeah I'm going to Bible College isn't that awesome? Linda: No, you are going to find some other girl up there. Me: Oh, is that what you are worried about? There is no way! You are the only one for me. Linda [clearly not convinced]: Ok, I think we can make it work. I was so surprised that Linda was so concerned. She was, and is, the best person in my life other than Jesus. Nobody could steal me away from her. I tried to console her during that conversation and the days and weeks before I left, but she was very sad. That concludes Part V of BatB. I'm not sure how much farther I'll take this, but if you wanna see more let me know. From here I live in Lake Arrowhead for about 9 months and that was an adventure before instant messaging, cell phones, e-mail, and Skype. Hey Patrick! I have been greatly enjoying reading this eventful saga about you and Linda! :) You should definitely continue it! Cool! It's kinda fun to share! OH. OH, OH!! OH, OH, OH NO!!! I THOUGHT MY SWEET LITTLE DAUGHTER WAS OUT WITH SUCH A SAFE AND SANE YOUNG MAN. DIDN'T I CALL YOU 'SWEET AND SHY' A FEW POSTS AGO??? MY HEART JUST ABOUT STOPPED AS I READ THIS. I'M HAVING YOU TAILED FROM NOW ON WHEN YOU RIDE YOUR M/C. STAY SAFE, OK? LOVE YOU! Woah! Look at how my mom is shouting out you!! You have incurred the wrath of Safety Sandy. :) You are in major trouble now, Mister Z!!! Patrick & Linda beginnings posts! Wow, that was fun! I dont check blogs very often... but stumbled onto hers and found this! I learned a lot that I did not know about you guys. You both are good writers! I loved it. Hey Sherry...thanks for the comment! Good times...glad you got a kick out of it!